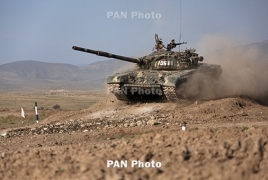 PanARMENIAN.Net - Armenia and Russia have agreed to continue supplies of Russian weapons to Armenia, Armenian Prime Minister Nikol Pashinyan said in an interview with Russia’s Kommersant daily published on Sunday, September 9, according to TASS. On September 8, the Armenian prime minister paid a working visit to Moscow and held talks with Russian President Vladimir Putin. "We agreed that supplies of Russian weapons will continue routinely," he said when asked about agreements reached at Saturday’s meeting with the Russian leader. According to Pashinyan, weapons supplies will be loaned. "We will discuss other options," he noted. "It is very important cooperation. I think we will have no problems in this sphere," he stressed. In November 2017, the Armenian government approved an agreement on a $100 million Russian loan to finance deliveries of defense products from Russia. Under the agreement, the loan issued at a three present interest rate is to be used in 2018-2022. Later, a number of media said that Russia could stop weapons supplies to Armenia following a chill in bilateral relations. However Russian Defense Minister Alexander Forim in early August 2018 refuted these allegations as "untrue." Drinking water linked to fewer sugary drinks in kids Children and teens who drink water are less likely to consume sugary beverages throughout the day, according to a new study. Canada to erect statue of Armenian Genocide missionary The statue was paid for by a donor from the Armenian community in Toronto. The sculptor is from Montreal.